Founder of Toward Music, Jayde is a scripturient with a consuming passion to write. With 12 years experience as a freelance music journalist, she's also a dedicated writer in the business industry with an undying love for typewriters & street press. There's no denying the powerful benefits of a happy, well-organised home. Our homes are an extension of who we are; so, everything we do inside them shapes how we feel and affects our productivity. Interior design can have a strong impact on our subconscious and perceptions, clutter hurts your brain and messy homes cause stress. The 'noise' of this chaos can be minimised by creating the feeling of organisation and space, however. And once mastered, it's easy to create your own haven away from it. Multifunctional pieces always make a great investment, especially for environments that are filled with busyness and activity. Sofa beds for when guests stay and beds with streamlined drawers are perfect for maximising space while acting as storage. For the kid's rooms, bunk beds that are attached to a homework desk with shelving underneath can make an area feel bigger. There are limitless benefits to purchasing furniture that's able to change its functionality or serve multiple purposes. You have the freedom to move or change up your décor while investing in pieces that save you space and money. Tip: Practicality can still exude style and sophistication! Every home, regardless of its size, should have a multipurpose furniture piece. Choose high-quality items that will last the distance. Whilst they may seem pricey initially, multifunctional pieces are key to extending its life cycle. Going custom-built encourages the opportunity for organisation and space, without sacrificing style. Customised cabinets inject a level of personalisation into your interior design, whilst taking full advantage of all the usable space in the room. And the best part about it is you get to steer away from stock cabinets that don't always store your items as effectively or look as good. Whether you're committing to a kitchen renovation or just after a better storage solution for your home or office space, going custom-built is the ultimate way to incorporate all your needs. Custom cabinets can be adjusted so even the most tedious layouts can be tackled and they can help refine the look and feel of your home. Tip: Use scaled furniture. One of the biggest benefits of investing in custom cabinets is that they're built to scale to suit your home's size. A small space doesn't mean you can't have large pieces either. Instead, create a polished and balanced space with one oversized 'feature' piece rather than multiple small ones. Avoid blocking natural light sources and pathways with furniture too. 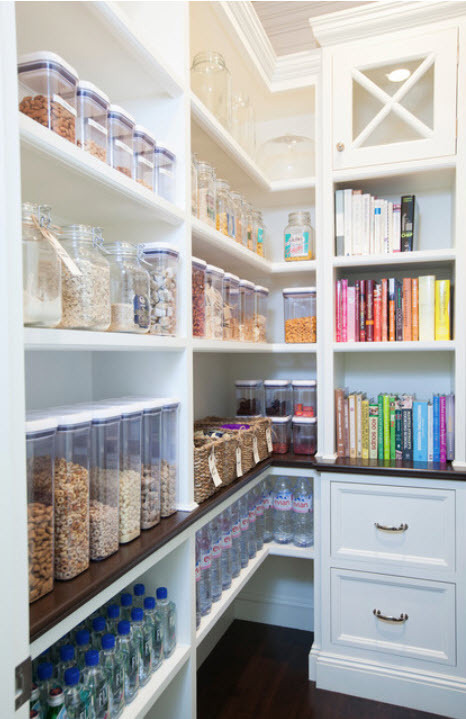 The kitchen pantry is responsible for a lot of storage so usually, it screams clutter! Get organised by clearing out everything in your pantry (the perfect spring cleaning job) and sorting. The most common problem for any size kitchen is the organisation of food supplies and cooking tools. 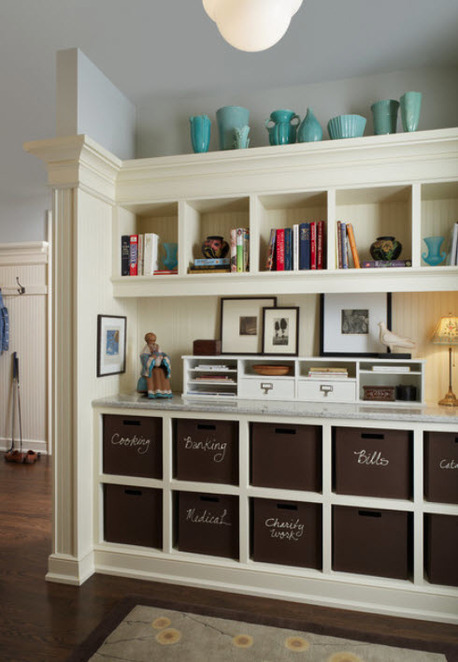 You want to streamline the chaos by sectioning items together for easy access and find better ways of storing stuff. Get along to one of your friend's Tupperware parties you've been trying to avoid and invest in some good quality storage containers. If pantry space is small, make the most of the room with rolling shelves. Recycled magazine racks are a great storage solution for can foods (and great for instant freezer shelves too!) and clear desk organisers can section pantry items better. Tip: A narrow rolling cart can serve as extra storage too. Use it to free up pantry space, by putting your main cooking items together. Herbs, oils, sauces etc can all be stored here. Alternatively, you can hang a rack on the side of your fridge or pantry to create more space. We rely on technology every day so it makes sense to utilise the net to eliminate clutter. If you're still filing away old bills and paperwork, consider moving things to digital to reduce the chaos and better the environment. Going paperless with electronic bills will prevent the admin stacking up and cluttering your home. If you do need to keep some on file, devise a colour-coded filing system with tabs for bills that need to be attended to each week/month. Binder files can make a great organisational tool for any paperwork or coupons too. Tip: Sell old items online and make some cash in the process! If budget is tight for home improvements, you can source inspiration and recycled products to create space and organisation in your home as well. There's a lot of unutilised space in the house you can tap into by changing the way you think. Vertical designs, such as floor-to-ceiling shelves, allow you to clear floor clutter and make sure of wall space at once. Take bookcases and cabinets all the way up for a smart storage solution. This naturally draws the eye upwards too, which is fantastic for creating the illusion of more space and high ceilings. Tip: Remember to edit! Just because you have extra shelving space, it doesn't mean you need to display everything. Use baskets for the lowest and highest levels to store items and allow your collections room to breathe in the spaces in between. If your walls feel like they're closing in on you, it's probably time to clear the clutter and create more space. These hacks won't just save you money and sanity in the long run, but help to craft a home that's a happy, healthy haven for relaxing and entertaining in. Are the photos from your home Jayde? Beautiful. you should do a before and after makeover for your home (you have good ideas).